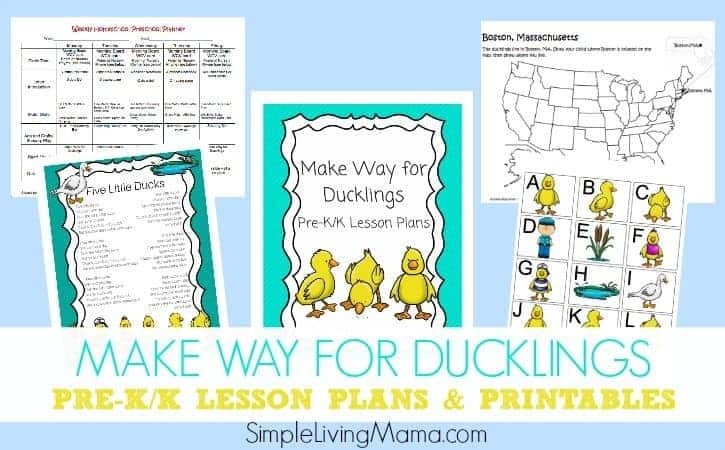 I mentioned last month how I sort of derailed from our typical book theme preschool lesson plans and decided to include lots of nature into our lesson plans because of the changing of the seasons. 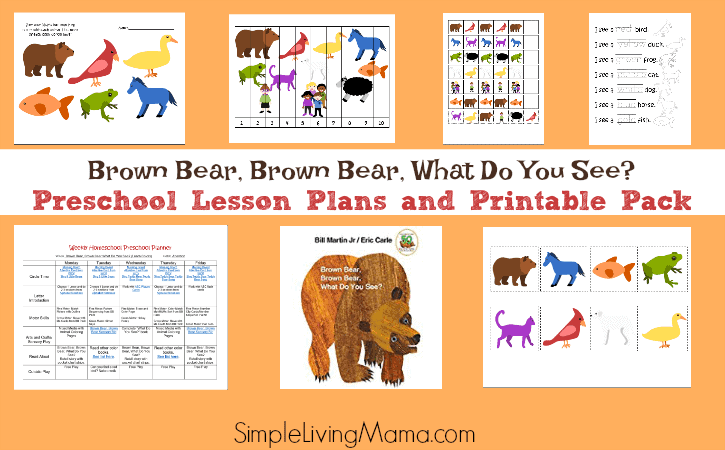 I find the fall months the perfect time to do seasonal preschool activities, so I was really looking forward to our leaf theme preschool and kindergarten lesson plans. 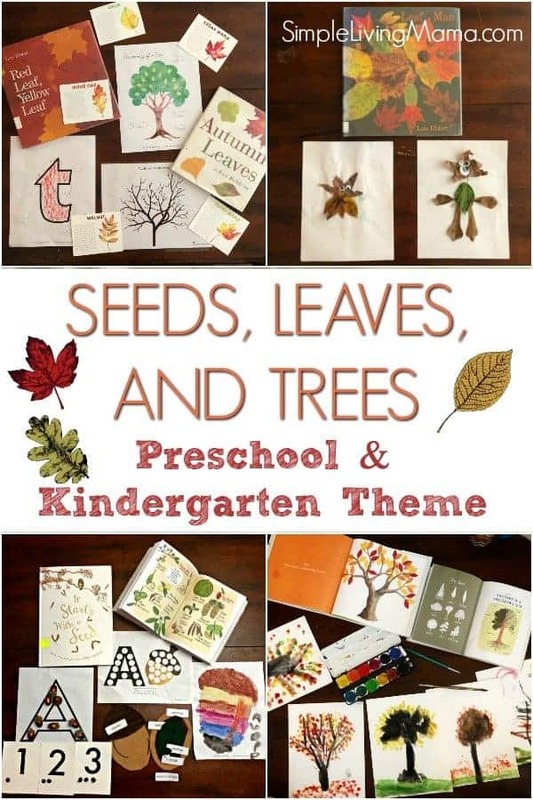 I did take the leaf theme a step further, and we studied seeds, leaves, and trees throughout the month! To begin our study, we focused on seeds, mostly the acorn, but lots of other seeds, as well. I did incorporate the Tree Unit from the Peaceful Press into several of our plans, but also did a lot of my own thing. 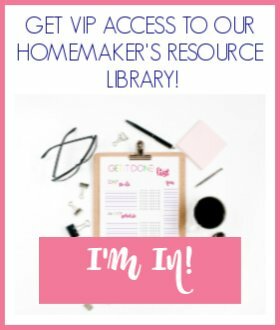 I will be holding on to that unit to use again next year, but if you know me, I love putting together my own homeschool preschool lesson plans, so I pull from several resources. 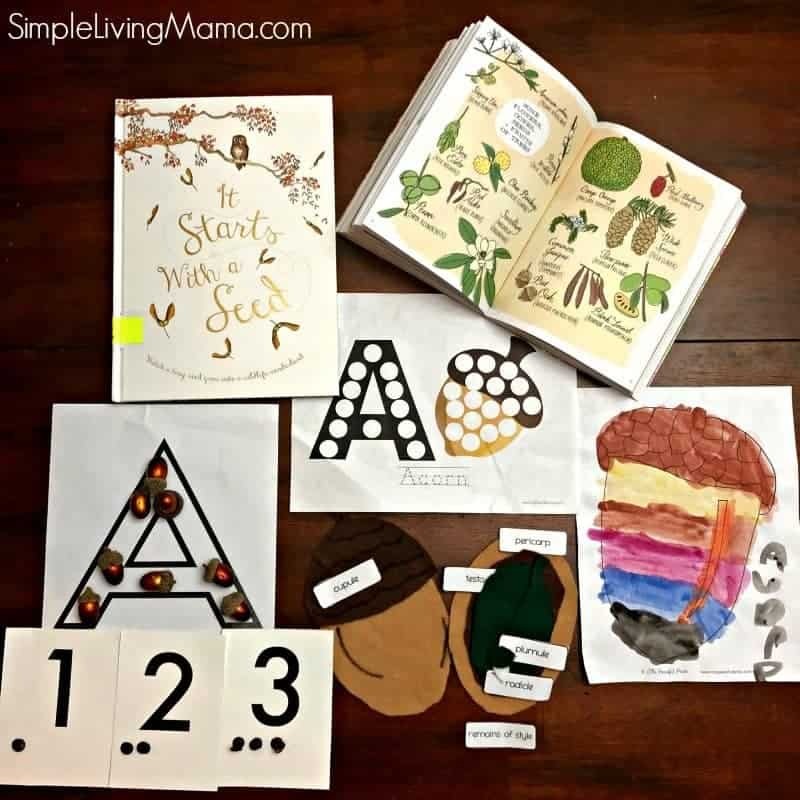 We gathered acorns from our yard, read “It Starts with a Seed,” looked at various tree seeds in Nature Anatomy, decorated a large letter A with acorns, and counted acorn caps. 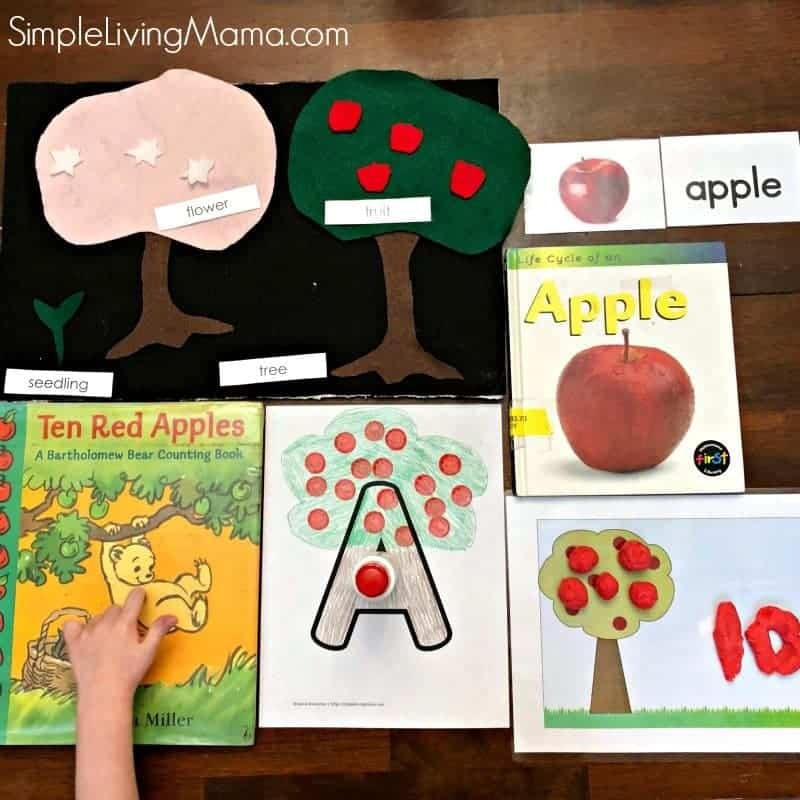 I love the felt acorn anatomy I made from the template from Mama’s Happy Hive, and the kids really enjoyed using watercolors to pain this acorn. 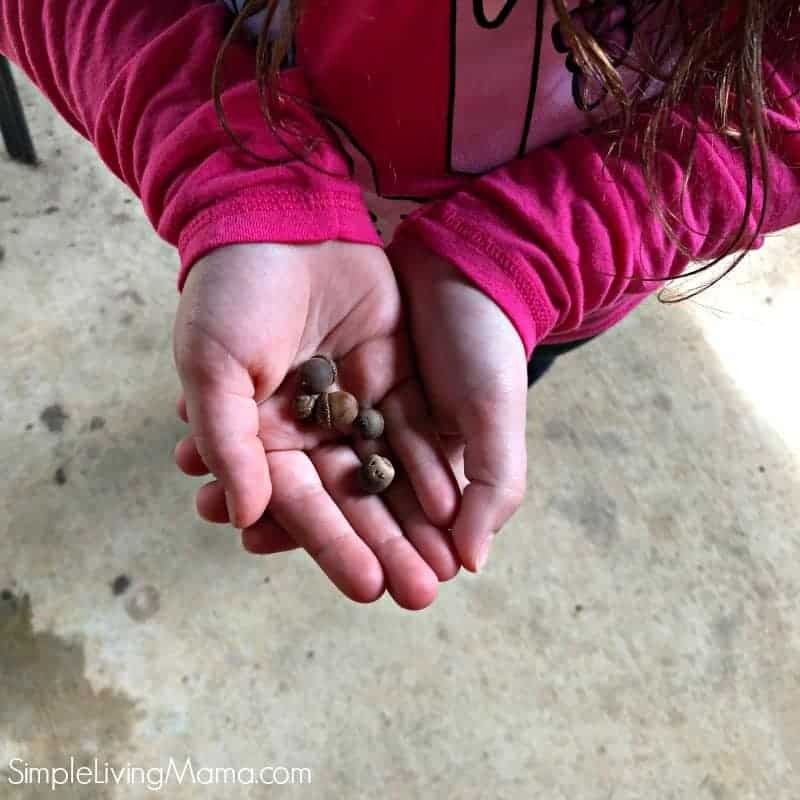 The acorns in our yard are so tiny! 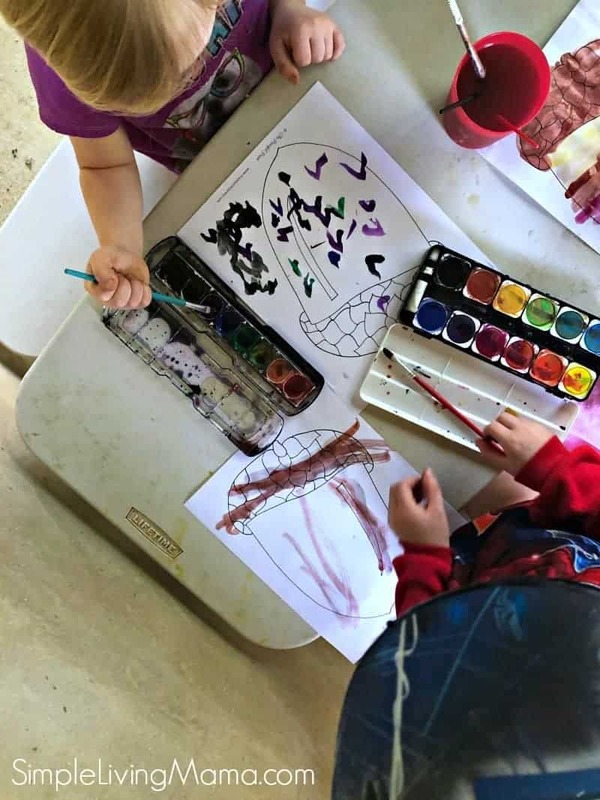 Outdoor watercolor painting is just perfect! Our leaves and trees lessons were really sort of combined. 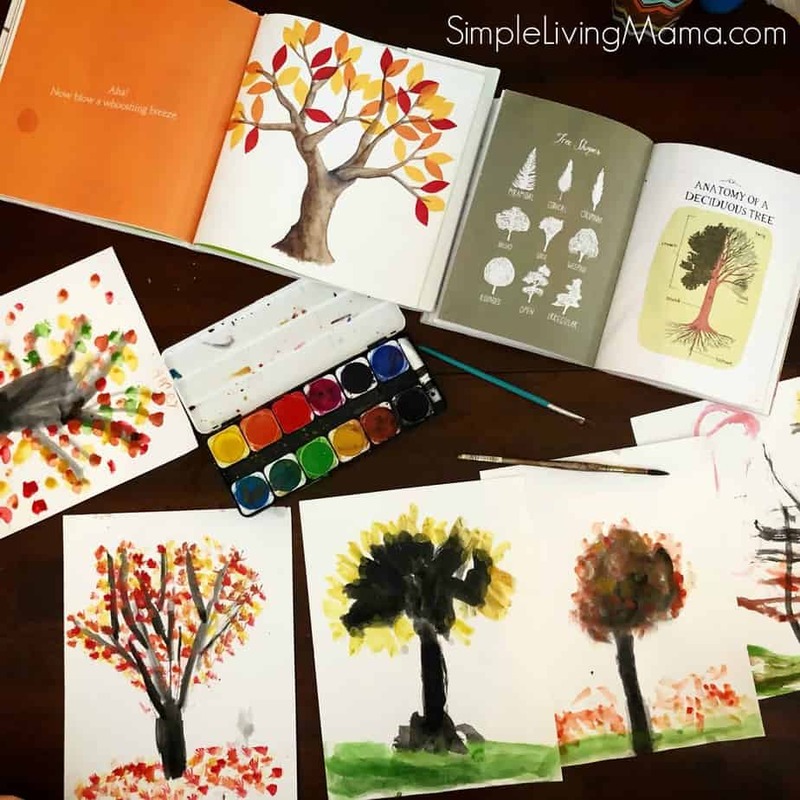 We talked a lot about the different trees we have in our backyard, read lots of books, and watercolored fall trees using a tutorial from Kids’ Art Hub. 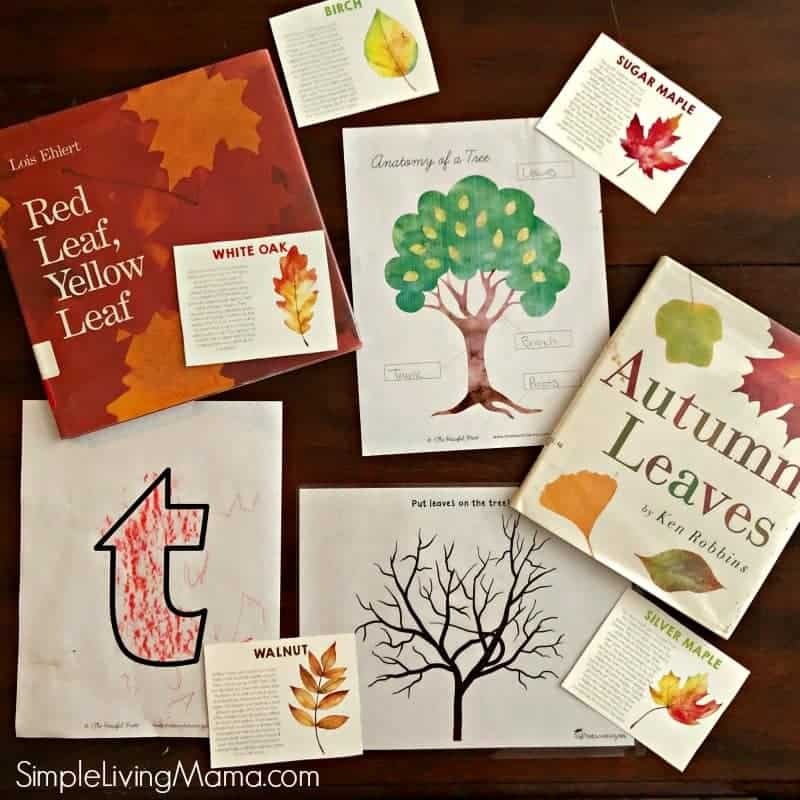 These autumn leaves cards are just perfect for helping us identify various trees and leaves in our area, and the anatomy of the tree from the Peaceful Press was an easy way to learn what makes up a tree. We also enjoyed making play dough leaves for this tree play dough mat from Totschooling, as well as the Shadow Leaf matching game. 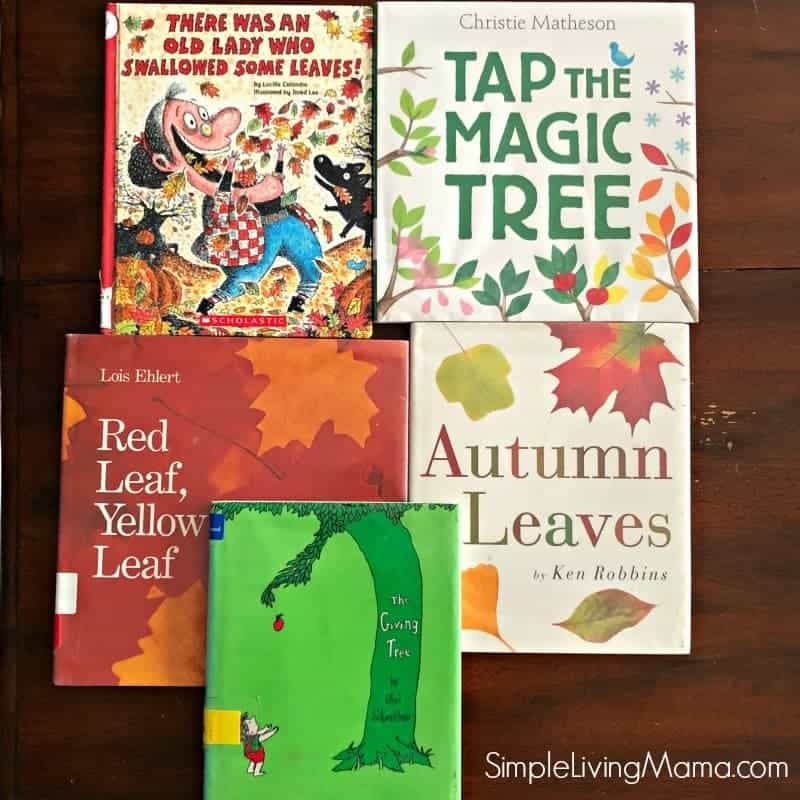 We learned that tree starts with the letter T, and did a bark rubbing with crayon on our lowercase t.
Here’s a look at some of the wonderful books we read during this unit. I wanted to get several leaf activities done during this unit. 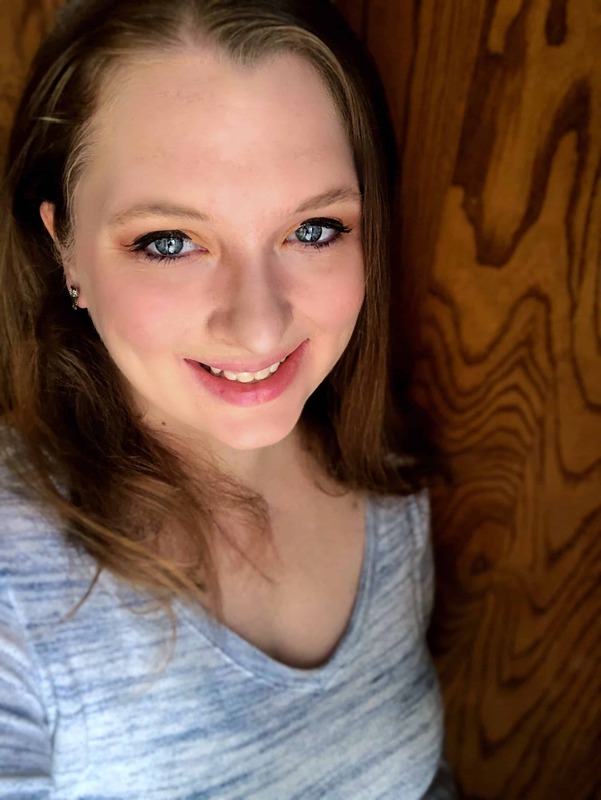 I had planned to collect gorgeous fall leaves and dip them in beeswax so we could make lovely leaf hangings, but that just didn’t happen. 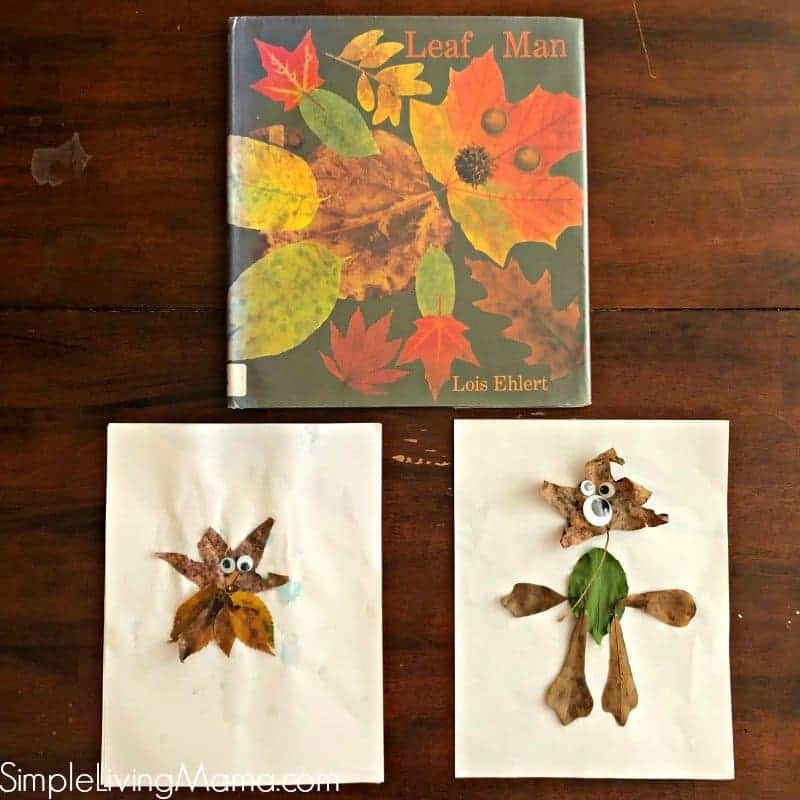 We did make our own leaf men and that was a super cute and fun activity! Here’s a look at what the kids created. I remember doing this when I was in grade school. It’s really good to get the kids involved with nature in simple ways like this, especially now in the digital age.